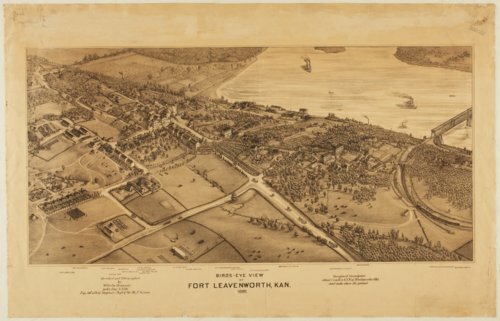 This black and white (brown) lithograph of Fort Leavenworth was created by Wilhelm Dannmeier, an architect, engraver, and lithographer who was top assistant to the Chief Engineer, Department of Missouri, United States Army. The names of the various buildings and areas are identified in the lower margin below the location of the building. The structures are not directly identified with numbers of letters. The major buildings on the post are listed. The Missouri River is on the right side of the lithograph.